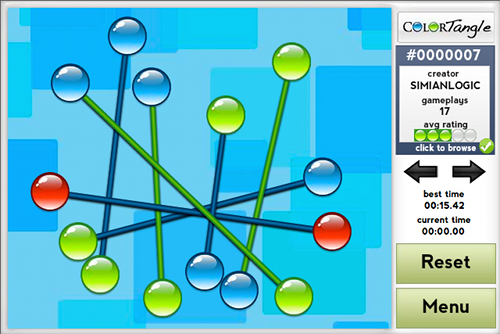 Description Colortangle is a game of tangled, multi-colored wires and nodes. Untangle everything to complete each puzzle! Click and drag nodes to move them around. Typically, nodes may only pass through like-colored wires. White nodes may pass through any color, and any node may pass through white wires. Black nodes cannot pass through any colors, and nothing may pass through black wires.